The last time I reviewed this location, it was named Yellow Bistro. People came in droves to experience Lorraine Godsmark’s dessert perfection but when she moved on, Brass moved in. 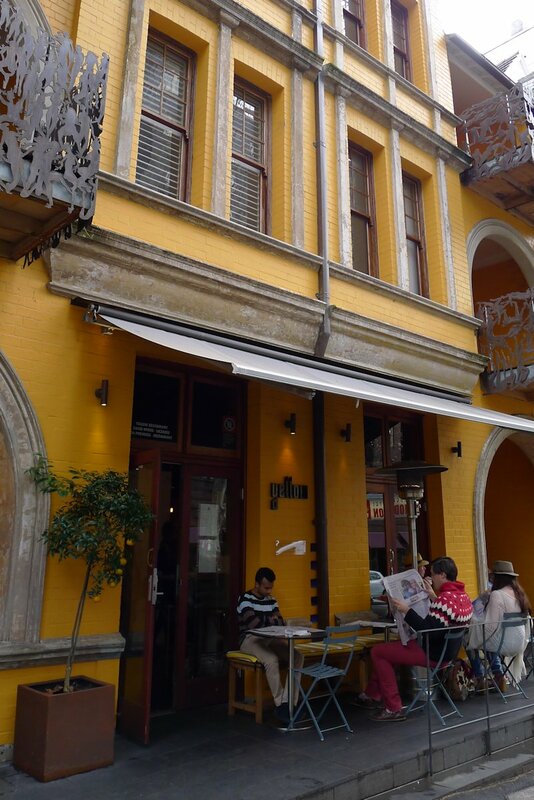 Its stay was short-lived and almost a year ago, yet still with some French influence, Yellow opened. With a distinctly warmer feel both inside and out, I was very impressed by the remodel and very excited to see what the menu had to offer. If you visit after 11AM (and prior to 3PM which is when brunch ends) then your offerings almost double but I’ll get to that later. I found the service to be fast and attentive. Our waitress had some personality and the manager was also courteous and on top of things. I noticed that one of the tables outside and around the corner may be difficult for the staff to see at times so be sure to make yourself known if you sit there! Wow! 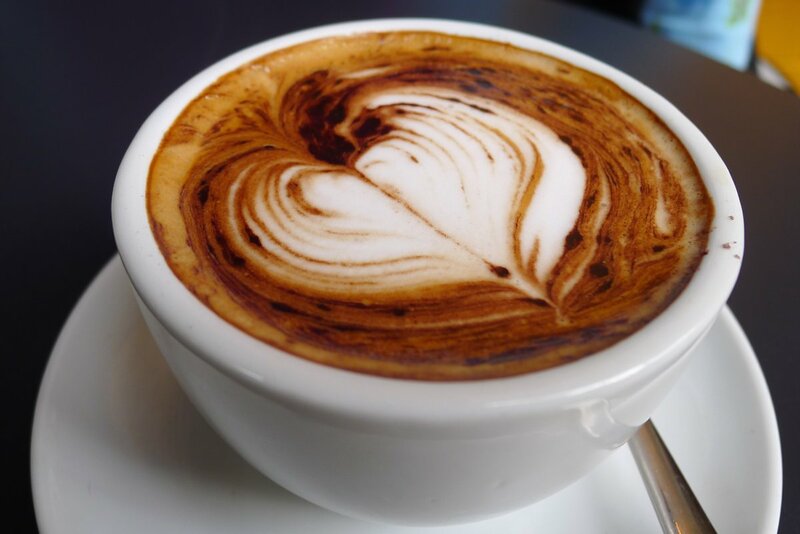 Fantastic cups of coffee ($3.50). 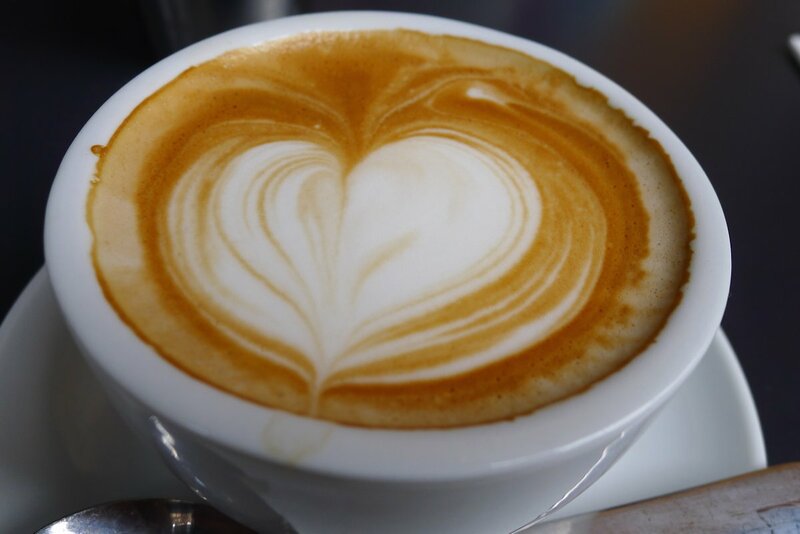 Vittoria Cinque Stella beans take centre stage and with good reason. You can be sure that there’s plenty of competition in the area but I’d certainly return to Yellow for these exquisite examples. Also available is housemade mandarin iced tea ($6), spiced carrot juice ($8), freshly squeezed orange juice ($8) and Eric Bordelet ‘Nouvelle Vague’ Sidre Normandy, France ($10). I honestly didn’t know what to expect when I ordered (just to see what it was like) the grilled licorice bread with housemade butter ($8). I thought that there would be streaks or dots of licorice throughout. Well as you can see I was completely wrong but it’s nice to be surprised and do you know what?… I’d order this again without hesitation! Originally conceived as a slight variation on a licorice cake that Yellow used to serve as a dessert, the recipe has been slightly adapted. 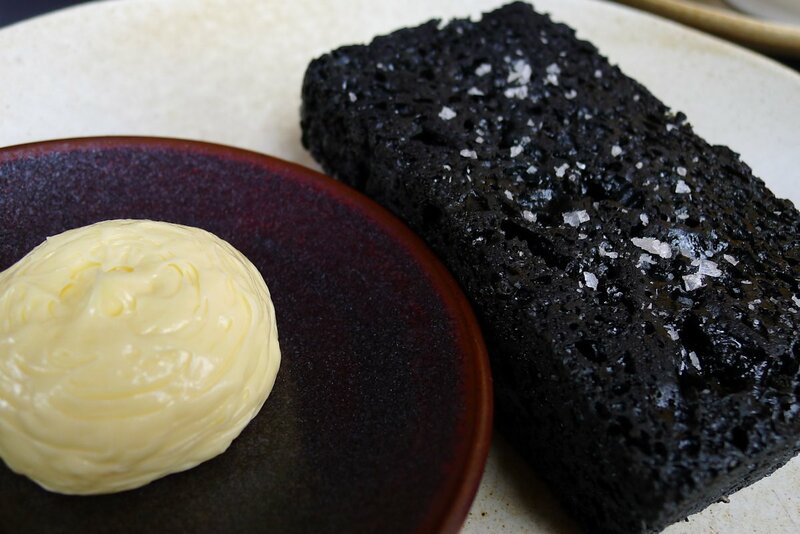 You certainly need to like licorice before you even consider ordering a slice of this bread as the flavour is very strong. The bread is soft, light and airy and because it’s warmed, the exquisite housemade butter melts through. I recommend sharing as it’s a lot of flavour in one slice. 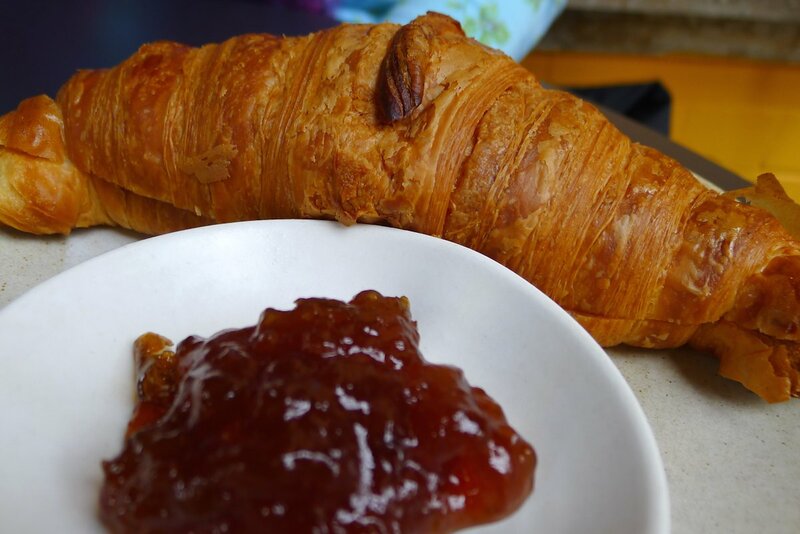 Absolutely faultless baked-on-site croissant ($6). That’s all I have to say and all that needs to be said. Dessert breakfast. Some of you will be up in arms while others will be scrambling to grab your keys and make a bee-line for Yellow! 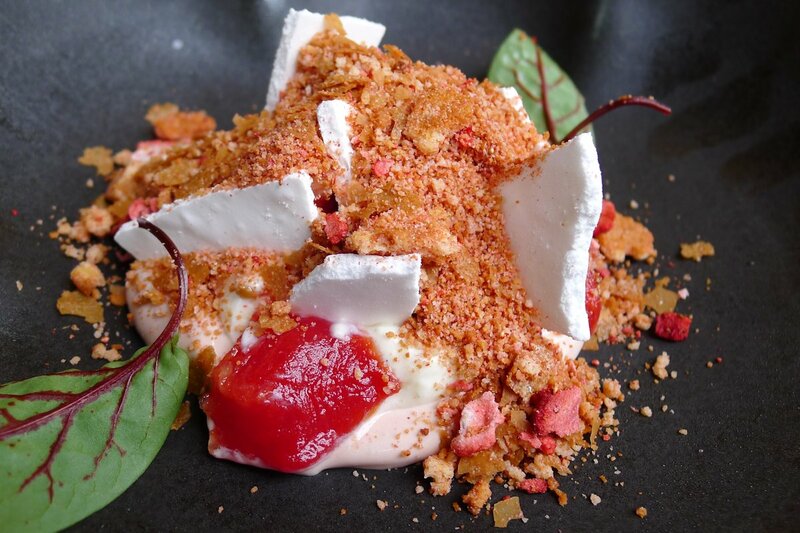 Presenting the strawberry ice cream with white chocolate & buttermilk ($12). So right at the base of this dish we have housemade strawberry ice cream which was softer than you’d expect but still held its consistency. The ice cream it dotted with freeze dried strawberries as well as dehydrated watermelon, both bursting with flavour. Swirled around this is smooth white chocolate & buttermilk which is covered with a crumble that is reminiscent of sherbet and contains dried strawberry flakes and dehydrated white chocolate cake! Slices of delicate meringue are dispersed throughout. All in all this makes for a unique and inspired sweet breakfast that is great as a palate cleanser before or after your savoury dish (or instead of). So this sounds simple enough. 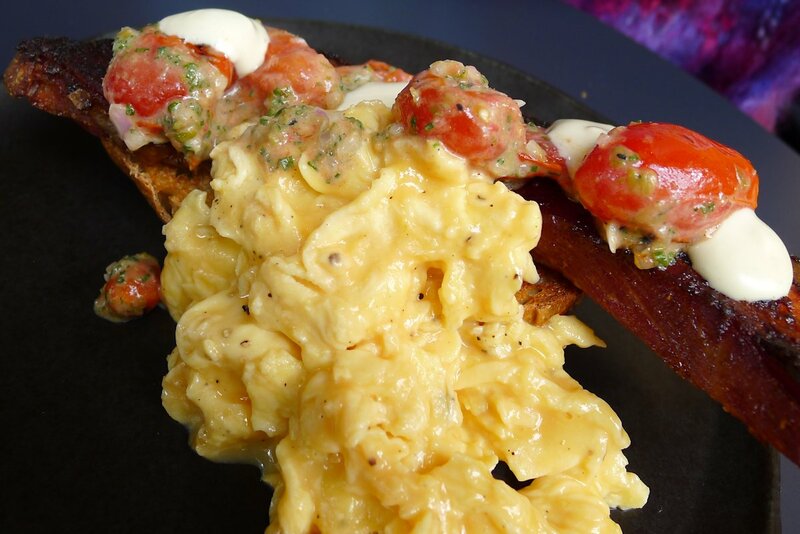 Scrambled eggs, toast, baby tomatoes & housemade bacon ($17). Executed brilliantly though as that long morsel you see is thick cut bacon that pulls apart in strips that look like extremely tender roast beef. Herbed grape tomatoes and dots of housemade mayonnaise rest on top and together these ingredients turned this into a dish worth experiencing! A neighbouring couple requested their eggs poached and Yellow was happy to oblige. While they cannot meet all requests, if the kitchen is reasonably able to help you with yours, they will. 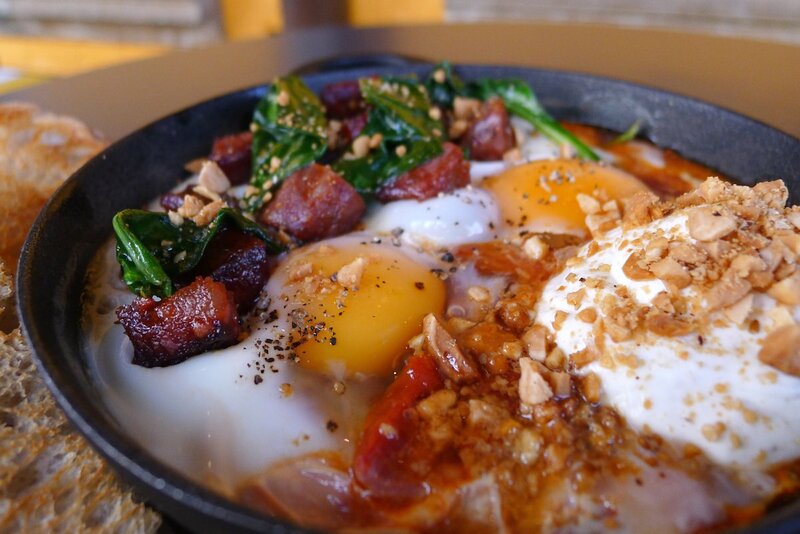 Baked eggs are obviously here to stay on the Sydney breakfast scene and this baked eggs with chorizo and spiced yoghurt ($17) certainly does Yellow proud. The chorizo was plentiful, the tomato base had a chilli kick and was delightfully thick, rich and warming – an outstanding winter warmer that arrived with the eggs still cooking slowly from the heat. The addition of spinach was a nice touch and the spiced yoghurt which I haven’t seen before was simply outstanding and complemented the sauce perfectly, cooling the chilli slightly. The consistency of the crushed nuts add a crunchy contrast to the rest of the dish. Highly recommended! 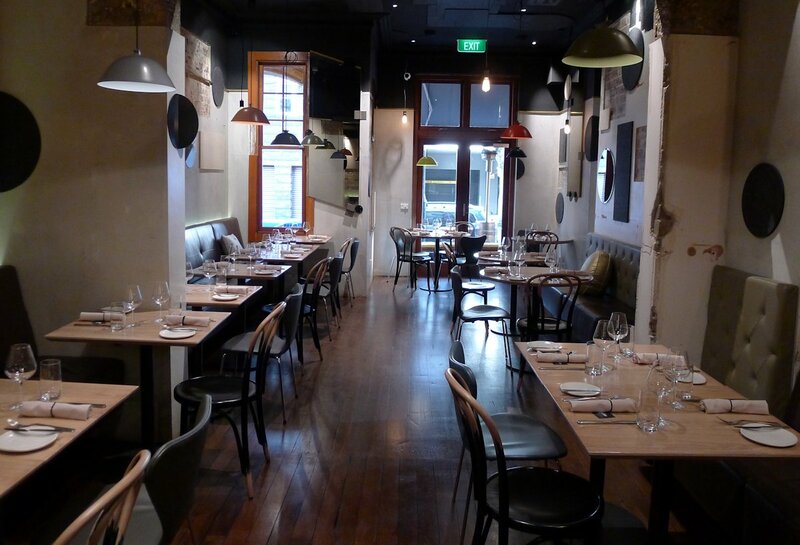 Also available are dishes such as housemade muffins ($6), muesli with poached rhubarb & yoghurt ($10), poached egg with charred onion consomme, mushrooms & peas ($16), fried egg, black pudding & shaved fennel ($18) and from the post-11AM menu: scrambled egg, jamon, harissa & aioli sandwich ($16) as well as braised lamb shoulder, spiced eggplant & garlic yoghurt sandwich ($17) to name but a few. When dining at Yellow, you have the constant feeling that everything is under control. They don’t rush, yet dishes arrive quickly, the restaurant is ordered and clean and when it comes to the kitchen itself, I have nothing but praise. Magnifique! This entry was posted in Sydney - CBD, Sydney - Eastern Suburbs and tagged Disabled access, Dog friendly, Gallery close by, Outdoor seating. Bookmark the permalink.